Traditionally, the family of poses that are meant to soothe the adrenals and tone the kidneys are forward stretches. 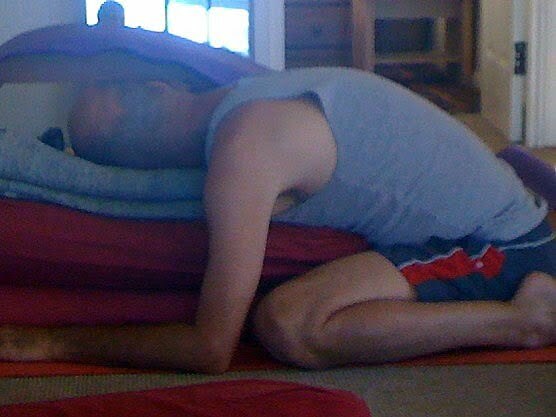 From my experience, the seated forward bends are helpful, but only if done with a nurturing and supportive approach. It’s counterproductive to have an attitude of pushing or pulling, grasping or overreaching in any poses, especially when you are already rundown. So, I recommend as a reconstituting pose for your kidneys, adho mukha virasana (kneeling forward stretch), resting the front of your torso on a bolster. Once settled into the pose and breathing with deep, soft inhalations and exhalations, relax your groins and the muscles of your lower back. Synchonise the movement of your breath with the movement of the back of your diaphragm and let the body and breath become one over 5 minutes or so.